LQHBA held their Fall Mixed Sale in Opelousas, Louisiana today (Nov. 17). OPELOUSAS, LA—NOVEMBER 17, 2018—It was a gorgeous autumn day in the Bayou state today (Nov. 17), providing an appropriate atmosphere for buyers to inspect and consignors to show their horses entered in the LQHBA Fall Mixed Sale in Opelousas. LQHBA cataloged 211 head, up slightly from the 185 entered in 2017, however there were 41 Outs. Buyers were more interested in getting their last chance for a Louisiana-Bred yearling with the top 10 sellers all foals of 2017. Last year's numbers were bolstered by several broodmares in the top-ten included the two high-sellers. The sale reported 133 head of 170 offered grossed $492,100 down 18% from 2017's $600,350. The average fell 22% to $3,700 compared to $4,727 in 2017 and the median was off 17% at $2,900 compared to $3,500 last year. "We appreciate all of our buyers, breeders, consignors and agents," LQHBA Executive Director Tony Patterson said late Saturday. "We wish everyone the very best of luck with all of their horses. Our Association now looks forward to Louisiana Champions Day on December 8th at the Fair Grounds and Louisiana Million night on December 15th at Evangeline Downs." Dennis Win paid $16,500 for the high-seller, Hip 11 Alicats Black Chic, a daughter of multiple stakes sire Jet Black Patriot from the Stoli mare Solit Allicat. Robicheaux Ranch Inc. Agent consigned the full-sister to Mardi Gras Futurity(RG2) winner Magic Black Jack. Jumonville Farms consigned the co-second high-seller, Hip 114, a colt by multiple stakes sire Jess Louisiana Blue. Charles Boudreaux paid $15,000 for the a half-brother to stakes winner JD Wagon Boss from the Fishers Dash mare Elly Mae. Tony Palermo, Sr. also paid $15,000 for co-second high-seller Hip 101, another Jess Louisiana Blue yearling from the Mr Eye Opener mare Never Neutral. Consigned by Palermo and Preston Jourdan, the sale disolved a partnership for the half-brother to 2018 stakes winner Mr Coronado Cash. Jess Louisiana Blue had a big night during the LQHBA Louisiana Million(RG1) trials on Friday (Nov. 16), siring three qualifiers for the $1 million final and two for the $40,000 LQHBA Louisiana Juvenile. 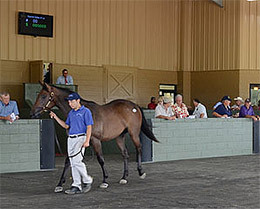 Dennis Mills Partners LLC purchased the high-selling broodmare, Hip 6 Jls Moma Mia from the consignment of Romero Ranch. The 10-year-old daughter of leading sire Heza Fast Dash sold for $7,200. Bred to Game Patriot, she is from the family of champions Jumping Tac Flash, Splash Bac and Carters Cartel. Ebelyn Rojas was the sale's leading buyer with two purchases grossing $26,500. Dennis Winn had 14 head for $25,000 and Barbra Kelly paid $16,500 for five head. Tate Farms, Agent for J & J Stables, LLC was the sale's leading consignor and/or agent with 17 head grossing $38,750. Robicheaux Ranch Inc. Agent sold five head for $23,500 and Jumonville Farms had two lots bring $27,000. Jet Black Patriot was the leading yearling sale sire (by average with two or more sold) with four yearlings averaging $10,125. Leading first-crop sire of money earners Five Bar Cartel had two head average $10,000 and Jess Louisiana Blue sold five for a $9,500 average. Freighttrain B was the sales leading covering sire (by average with two or more sold) with two in-foal mares averaging $5,100. Jet Black Patriot had two for $5,050 and Jess An Idea sold three in-foal mares for $4,067. For preliminary results, including hip-by-hip prices CLICK HERE.